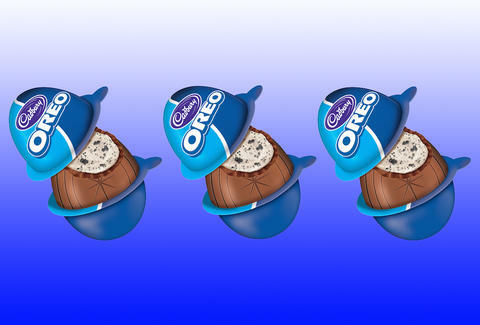 There’s basically a limitless number of ways to reinvent the Oreo. In recent months, we’ve seen Swedish Fish Oreos, chocolate strawberry Oreos, apple pie Oreos, and Oreo chocolate candy bars get junk-food mavens excited. But this, this might take the Oreo chocolate cake and register as the behemoth of all cookie concoctions: According to Junk Banter, Oreo Cadbury Eggs exist, and man do they look damn delicious. Unfortunately -- and keeping in line with many a sinful treat -- these Oreo Cadbury Eggs are only available in Canada. If there’s a tiny violin playing in your head, get ready for those tears to stream even more: Oreo Cadbury Eggs are also available in the United Kingdom, according to The Independent, which makes sense, considering the chocolate, creme-filled egg originated in England. In the U.K., the eggs come in packs of four, and it’s suggested you eat it with a spoon, just to maximize the sugar-fueled gluttony of it all. In the United States, you still have a lot of Oreos to choose from, so don't despair.